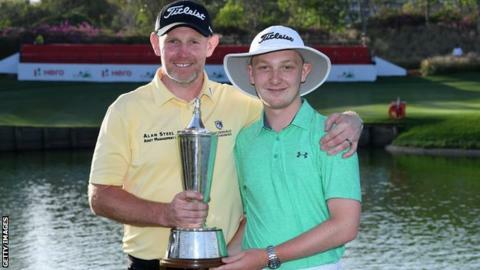 Stephen Gallacher said his "big win" at the Indian Open was made more enjoyable because it came on Mother's Day with his son, Jack, as caddie. The 44-year-old Scot came from behind at the DLF Golf & Country Club to secure his first European Tour winner's cheque since 2014. "He's got 10% of it," Gallacher said of 18-year-old Jack. "It was great to have him on the bag and it's Mother's Day as well. It makes it even more special." Gallacher particularly enjoys the course in New Delhi, where he finished one stroke ahead of Japan's Masahiro Kawamura. "It suits a lot of mid-to-long irons, which is probably my strong point, and I love curries, so I'm enjoying myself at night," he said. "I don't know what it is about here. I've finished top 18-20 every time I've played." Gallacher holed five birdies on the back nine to finish one-under par for the day and nine under for the tournament. "When you're 44, you're in the twilight of your career, so it is a big win for me and it's good to finish it the way I did," he said. "Three under in the last four is a great way to finish it and I'm chuffed." Gallacher's win came despite a quadruple bogy on the seventh hole of the final round after a wayward tee shot. "It was up against the out-of-bounds fence and I had nowhere to go but back to the tee," he recalled. "I hooked my next one and lost that, but I was pretty calm after that hole. "To see I was only five back gave me a bit of encouragement. I played the eighth lovely and knocked a three-wood on to the green at nine and that kept me going." Gallacher, currently down to a world ranking of 208, shrugged off recent injury struggles to secure the title. "When I knew I was only five back on the eighth tee, I thought 'just hang in there.' And, when I birdied 15, I saw that Julian Suri had came back from the top and I thought I was one behind," he added. "And then, when I got to the 16th green, they had changed it so I was tied for the lead and I just tried to finish as strong as I could up 17 and 18. I did that and, thankfully, it was enough."